Selecting the best defensive handgun can be a difficult task, especially for those who are new to the whole business. The major problem is the fact that there are so many good handguns available today for personal defense. And that is coupled with the fact that so many firearms instructors and gun experts are quick to tell you that their choice is the best, and that only a fool would look elsewhere. The real problem is that finding the perfect defensive handgun is a very subjective search. The fact that Brand X may be all the talk and is selling like hotcakes down at the local gun store really doesn’t matter if the gun doesn’t fit you and suit your particular purposes. When you begin to search for that special handgun, you should realize that there are two different dynamics at work. To begin with, a person, especially a new shooter, should take the opportunity to examine and shoot every defensive handgun possible. You can limit the number of guns to be examined by sticking only with guns of good quality; it’s just not a good idea to bet your life on a gun that is poorly made. The lucky folks are the ones that live near a shooting range that will rent guns to shooters. A person can get a lot of trigger time that way. And the rental range allows the shooter to do side-by-side comparisons of different guns, different actions, and different calibers. The key is to not get in a big hurry; take your time and shoot different guns during several different visits to the range. Similar opportunities exist at most public gun ranges. It is amazing how many shooters are happy to let someone examine their handgun and even shoot it. It’s a good idea to be sure and take your manners along on these shooting trips and don’t forget to offer to pay for the ammo that you shoot. However, this search for a personal, personal defense gun is also compounded by the fact that you are also learning more about marksmanship and personal defense. As you shoot different guns, you will develop a better opinion about what feels good in your hand, what safety features work best for you, and which gun you can shoot quickly and accurately. The main reason many folks are always swapping guns and buying new ones is because they are in the midst of a learning process and improving their equipment to stay up with their new-found skills. At the point that a shooter thinks that he or she has found the gun that works best for him or her, it is time to take it to a good defensive shooting school. Instructors put students through various school drills, which is an excellent way to discover weaknesses in a handgun choice that had not been apparent before. Such schools are a great place to not only learn more about personal defense but also to learn more about just which guns best suit one. Fortunately, many of these places also have guns for rent, so one’s defensive education can continue. The time will come when you reach the point of diminishing returns. Your skill level is up, your gun knowledge is up, and you have begun to find the handgun that suits your personal-defense needs. Many years ago, I found that I do my best defensive work with a 1911 pistol, a Browning Hi Power, or a Smith & Wesson K-frame revolver. I can run them in the dark and run them without giving conscious thought to it. This does not mean, however, that I think that newer gun designs are unworthy. It just means that I’ve found what works best for me. We live in an era of instant gratification. People are tempted to spend a few hours, or a few days, doing some research and expect to come up with a respectable level of skills and knowledge. It is best, however, to look at personal defense as a form of continuing education, an education that can go on for years. In short order, a person can find defensive handguns that will get them by, however, they should not quit learning and seeking that particular kind of handgun that suits them best above all others. Most will find it an enjoyable task. Besides, what’s not to like about lots of trigger time and putting lots of lead downrange? 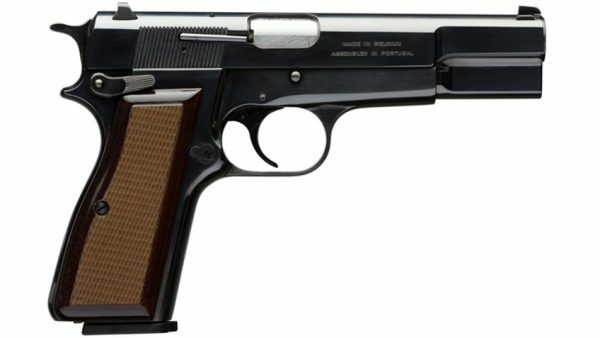 Browning Hi Power Standard image courtesy Browning.com. This entry was posted in Guns, Personal Defense, Revolvers, Semi-Auto and tagged 1911, browning, S&W, shooting illustrated, smith and wesson. Bookmark the permalink. Jim, I too shoot my best with the same weapons. I think it may be because we had to “learn”our skill with d/a revolvers. We has to really learn our skill and it transfers over to other weapons. I think those that only master the “safe trigger” striker fired modern weapons are not doing themselves any favor. The harder it is to learn, the more use you’ll find. great article as always Sheriff Jim.